With so many places to shop for home décor, where do you go? You could go to a large department store, but do you really want something that everyone else has? Something that you’ve seen a million times with no real expression to it? Audrey’s Attic may just have what you need for your Wooster, Ohio home to give it that primitive prairie look so many people love. 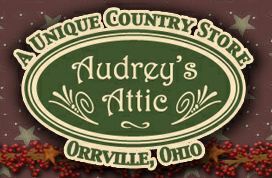 What makes Audrey’s Attic so much better than your average department store is the country style home décor that Audrey’s carries in stock. Not only that, but there is always a large selection of unique seasonal items you will have a hard time finding anywhere else in stock. Looking for something a little more special, like a clean burning candle for your Dalton, Ohio residence? Audrey’s Attic has those too! Don’t wait any longer; come in today to find that perfect addition to your Doylestown, Ohio home!